In our latest collaboration with Depot Basel, the twenty-third edition of TEOK was conceived to respond to the theme of SPECTACLE. Presenters Mathieu Bujnowskyj and Alfredo Brillembourg (with his band BINZ) took us on a wild ride from the hills of Burma’s new capital Nay Pyi Taw to Basel’s White Horse Hotel, and it felt like a real celebration within the space’s walls. Thank you to our speakers, hosts and audience – on to the next! I was delighted to represent TEOK at Depot Basel’s initiative Forum for an Attitude. During the 4th iteration of the Forum, with the topic “Knowledge”, I gave a lecture on the many different ways of knowing that we encounter in life, and how the development of TEOK allowed us to further our definitions of what we know and what we think we know. It was great to spend some time with the fantastic participants of the Forum and enhance my understanding of knowledge over the weekend. 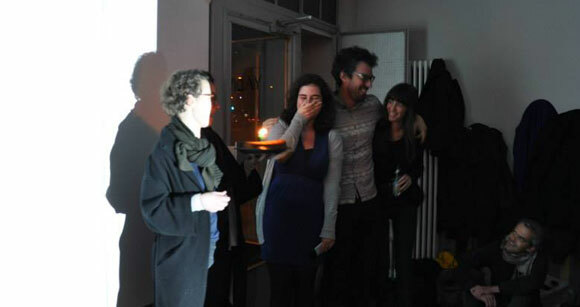 Thanks to Depot Basel and Matylda Krzykowski for the invitation! For its thirteenth edition, TEOK collaborated with Dutch design collective Fictional Collective in the initiative Thisiswork.org, curating an event around the topics of Debt, Currency, Value and Trust. 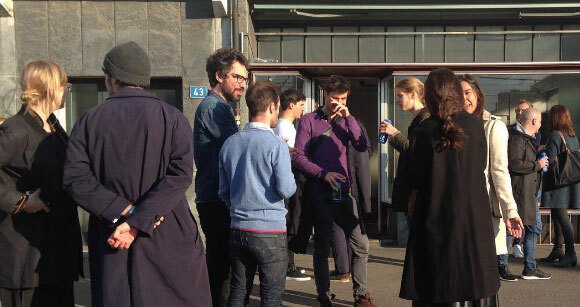 Our thirteenth session was held at Depot Basel. Titled Common Wealth, the event explored financial systems both implemented and emerging, analyzing alternative currency and value systems. At the core of the evening was the questioning of of trust: can it be undermined, exploited and used for nefarious ends? A reflection of the many ways in which spam has evolved to become more and more sophisticated allowed us to critically enquire which are the limits of trust in the digital world. The event is complemented by the reflections collected in the “This is work” publication, Chapter #4 Common wealth. It was a pleasure to collaborate with the young designers of Fictional Collective, and as always a pleasure to return to Depot Basel for a TEOK. A detail of Depot Basel’s DISPLAY publication. 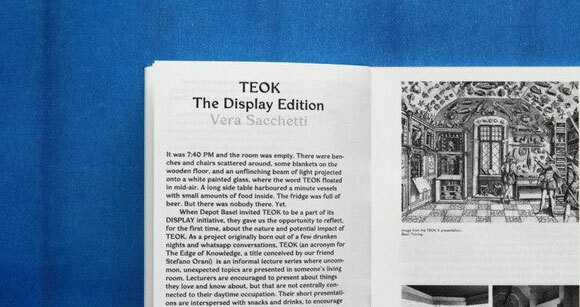 Following the tenth edition of TEOK, I wrote an essay for the DISPLAY publication launched by Depot Basel following its exploration of the theme in a series of spacial interventions, lectures and events at their Basel location. My contribution focused on the mechanics and structure of the TEOK held at Depot Basel, and reflected on the things learned following that evening. A big thank you to Matylda Krzykowski for the invitation to contribute to the publication. 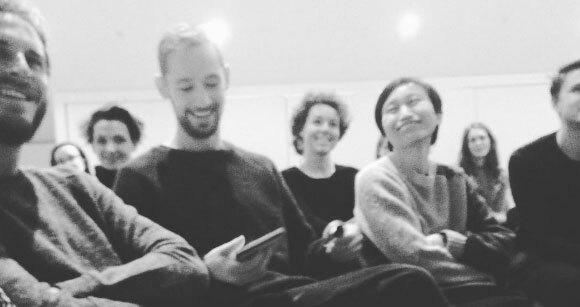 Basel-based contemporary design space Depot Basel invited TEOK to curate an evening of presentations around its current exploration of “Display”. The event coincided with the first anniversary of this informal lecture series curated by myself, Juan Palencia and Marta Colón, and it was also the first time TEOK opened its doors to a general audience and to a larger number of participants. The evening was structured around the topic of Display, and we had presentations on Spanish roundabout art, nature and its representations in art, and the history of display in Natural History Museums. It was a pleasure to be invited by Depot Basel and to reflect about Display with our guests.